We’re not simply experts at building garages; we’re experts at building garages to suit your needs. From versatile barns to spacious sheds, our entire range can be customised to suit your personal specifications. Our range of products spans single, double and multi-bay garages, popular contemporary barn-style sheds, light industrial buildings and farm sheds. We can fully manage your project from planning right through to preparing the concrete slab and installation. Or if you prefer to install your shed yourself, we will provide the necessary instructions and after-sale support. Why choose us for sheds, garages and barns? So what makes our buildings so dependable? Why are we the most trusted supplier of sheds and garages in Hobart, Launceston and wider Tasmania? Just look at the frame connections; all connections are fully bolted for greater strength and durability. 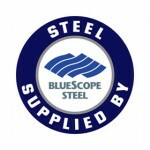 And all of our sheds are made from Australian Bluescope® steel with a 15-year warranty, for your peace of mind. Check out our next steps to the right and request our garages & sheds brochure and price list to find the right garage, shed or barn for you. The numbers in the brochure match up with the numbers on the left hand column of the price list. Also, feel free to browse our Garages, Shed & Barns Galleries. Whether you live in Hobart, Launceston or anywhere else in Tassie, Rainbow Building Solutions can modify any of these designs to suit your needs. Our designs are available with up to 20m wide spans and increments of 1mm. So if you need something that is not here or want to modify any design, please send us an enquiry or give us a call on 1300 737 910. All our buildings are class leaders. Designed to be dynabolted to a level concrete slab or concrete footings, dependability and robustness have always been our focus. We can however, adjust our columns for in-ground construction ensuring every customer request is met. Rainbow Garages and Sheds are bolted together with a heavy-duty laser cut folded bracket greatly simplifying construction. We use a minimum C150 C-section purlin as the main portal frames with top hat purlin for the wall and roof girts. All screws and bolts, including dynabolts, are supplied. All exposed screws and rivets are supplied colour matched to the sheeting and flashings. We use as a minimum 0.42 BMT (0.47 TCT) roofing material (normally corrugated unless otherwise stated). This ensures that the roof is trafficable: a person can walk on the roof without fear of damage and/or falling through. We use a minimum 0.42 BMT (0.47 TCT) low rib wall cladding on the walls for all sheds and garages up to 3.0m. Any wall 3.01m and over we will use high rib wall cladding 0.42 BMT (0.47 TCT). However, if requested we can use 0.42 BMT (0.47 TCT) high rib wall cladding on walls with heights below 3.0m. What’s all this shed talk? BMT stands for: Base Metal Thickness. This is the thickness of the metal before any coating process has begun (ie colour, rust inhibitors etc) TCT stands for: Total Coating Thickness. This is the thickness of the metal after the coating process has been completed. This thickness can vary depending on many external factors. Prices for Rainbow constructions include all engineers’ drawings and certificates required for Council approval including Form 35a. The only drawing not provided is a site plan, which can be done by you or any draftsman. To have Rainbow draw up a site plan simply contact Rainbow for a quote. All our products are classed Region A which covers all of Tasmania, Victoria, New South Wales and South Australia with a wind velocity: Vp = 41m/s : Vu = 50m/s. Terrain category 2&3 as according to the Building Code of Australia. Our prices include all gutters, flashings and downpipes (to ground) unless stated otherwise. The price is always for a full Colorbond® finish (roof, walls and trims) unless otherwise stated. Shed kit prices on the standard price list include roller doors, engineers’ plans & specs (Form 35a) but no other accessories or extras. Whilst our brochure will give you an idea of what we can build we are not restricted to these sizes and dimensions. We pride ourselves on being able to tailor a building solution to your precise requirements. In fact, we can manufacture any size you can imagine to the nearest millimetre up to a 20.0m wide. If you have any special requirements please call us. We’ll happily show you how we make any request possible. A site plan which needs to be drawn to scale is also required. This is required to be completed by an accredited building designer. Rainbow Building Solutions does have an accredited building designer on staff and can provide this service for a fee starting from $450.00 (incl. GST) subject to location of property, site conditions and size of block. This fee also includes a Form 35a (Certificate of the Responsible Designer – Building Work) and Form 35b (Certificate of the Responsible Designer – Plumbing Work) to cover that site plan. Some Councils and/or building surveyors will also require a Bushfire Attack Level Assessment (BAL). Rainbow’s standard set of plans and engineering specifications does not include a BAL Assessment however Rainbow can arrange a BAL Assessment to be completed. Additional charges may apply. Take all of the above documents to a Building Surveyor to receive a Certificate of Likely Compliance. Once all documents (see above) have been obtained by you, these are then to be submitted to your local council (including the applicable fee) along with the council’s relevant application forms. Most council’s are now privately certified. This means that the Council no longer checks your plans or inspects the slab and/or footings. This is now done by a private building surveyor. The only inspection that the Council performs is a plumbing inspection for the connection of the storm water. This means that you will need to see a building surveyor to receive a Certificate of Likely Compliance before submitting your plans to Council and before the Council will accept your plans for a Building Application. To find out whether your Council is privately certified, check out the Local Government Association of Tasmania (LGAT) website by clicking here. You will also find information relating to council boundaries. Or simply phone your local Council directly for more information. Please note that this information is accurate as at August 2012 and is subject to change without notice. The price for a Certificate of Likely Compliance start from approx $550 and increase depending on location and size of structure. Rainbow have a dedicated team of installers and other contractors to help you install your shed for a fee, including laying the concrete slab. What size do you need? Browse through the brochure to get some ideas on what you may like. Will it be used for storage or for vehicles? Or a workshop? How much room is there for installation? You can choose from Zincalume® or from the great Colorbond® range. You can also pick a different wall and roof colour to match the nearby house or choose any colour from the Colorbond® range at no extra cost. You can add a personal entry door (PA Door), window or skylights. Or make your life that much easier with a remote opener. Decide whether to order the shed straight away before council approval or after the council have approved the shed. By ordering the shed straight away the order is locked in regardless of whether the council approve the building or not. Alternatively, obtain council approval first then order the shed after that. Either way, we have options to accommodate your needs! *Rainbow can assist you submitting plans to your local council. Now comes the fun part! Once the shed has been fabricated someone from the Rainbow team will contact you to arrange paying the remaining balance. Once the balance has been paid a delivery date will be organised to suit you. We won’t just dump your brand new shed on your block! Need someone to erect the shed for you? Or want to tackle installing the shed yourself? Or you can install the shed yourself by using the instruction manual and construction notes. Step 7 – relax & enjoy your very own Rainbow! As an independent Tasmanian owned and operated business, Rainbow has developed a strict and thorough quality control and detailed checking system over the past decade – to help reduce and even eliminate the chance of damaged or missing parts in each and every shed we deliver. We are so confident that everything will be delivered to site as expected, that if you do discover a discrepancy, just call us and we will make it our top priority to immediately rectify the situation. Rainbow will be responsible for the cost of repair or replacement of parts and delivery for an appropriate resolution. 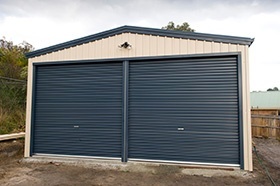 Together with our 15 year BlueScope Steel Warranty, we believe in solid measures to guarantee you get exactly what you expect in a Rainbow shed, and enjoy it for years to come. Strong modular construction utilises deep-ribbed high-tensile Zinc and Colour roll-formed sheet, with heavy gauge channel sections. Manufactured to engineered specifications, testing confirms that when correctly assembled and anchored, the units will easily withstand strong wind loads. Versatile design system allows you to specify the position of doors and options such as windows and skylights, as well as selecting either Zinc or any of 20 standard colours. Wide range of options including 5-blade louvre windows, skylights, double doors, extra height walls, T-handle security sets, as well as a range of anchoring systems to suit various base types, readily available. Quick response to customer requests: typically even special units can be manufactured for delivery within 14 days.